Zucchini and shirmps is a well known pair in Italy. It’s a simple sauce that requires very few ingredients and has a delicate yet interesting taste. Remove the shells and the heads from the prawns, cut their back with a knife and kindly remove the little black thing you’ll find inside. It’s the intestines, and while it’s totally safe, it’s not nice to see. Roast them in the pan without any fat for two minutes per side at medium heat, until their back opens like a sort of.. “rose”, then put them aside. Put 4 tablespoon of oil in the frying pan and a smashed slice of garlic, let it flavor the oil at lowest heat, while you thin slice the zucchini. Remove the garlic and place your sliced zucchini, higher the heat and let them sauté in the oil, until they’re soft but not burned. Then add the shrimps, a grind of pepper and let them cook a little before adding the half glass of white wine. Adjust of salt. 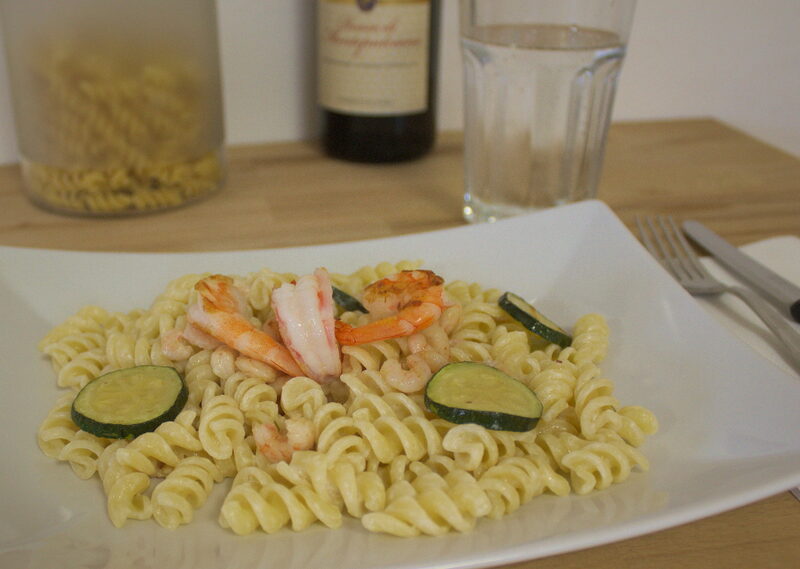 Meanwhile cook your pasta on hot salty water, and when it’s al dente, add the pasta to the frying pan with a little bit of its water and the prawns you kept aside. Cream at high temperature for a minute or two, until all the water evaporates. Serve very hot, and allow your guest to grind some fresh pepper on top. « Coffee chat: Not really.. she’s gone, again.